I bought this book in 1995 and in those days I was working full-time and taking care of a farm and doing many shows. I bought books that interested me in hopes to read them. Most of the were skimmed over and put away. Now I a going through all my books and this one popped out. I am into it and find it so interesting. It is about the people of the south, weaving and so many other things. Coverlets are covered at length. Overshot weaving is has been my favorite thing to weave and is why I will probably get back to weaving but on a smaller loom It discusses the patterns and how people wove and how they were put together. So many interesting facts are explained in this book. One example is when you do see old coverlets where the blocks don’t match it may be because when they were taken apart to wash the person decided that there was too much wear and reversed the material. Another fact is when a house was burning you got all the people out and then got the coverlets. Most were family heirlooms. . This book is full of interesting facts both for the weaver and the historian. Another year has passed by and we enjoyed what may be the last hook in at The Salem Cross Inn. It is a big undertaking and Sandy has done such a wonderful job. We will know in the spring if it is to take place. For my friend Debbie and I it has been a day which we had looked forward to all year. Our favorite day to be exact. Full of hooking, seeing old friends and meeting new ones. A time to replenish stocks and get new ideas. Always a wonderful atmosphere and a great meal. We hope if Sandy decides not to do it someone else will take it over. This wheel was given to me in a box. I have spent many hours trying to put it together but it wasn’t until I went to Lavender friends Sandy and Glen did we three finally figure out how it all goes together. Glen is going to glue the pieces he can, and fix whatever he can, he is a genius woodworker!! 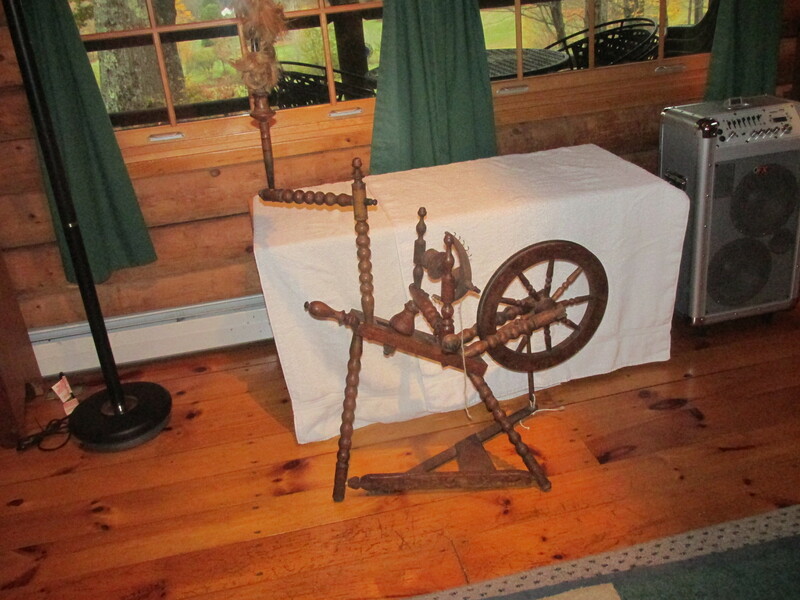 I am in the process of sending pictures to THE BOBBIN BOY, the fixer of all wheels. I just found out about him and he and his wife are extraordinary people. I hope I have a chance to meet them in person.. I will keep you informed of the wheel’s makeover. This wheel is very small and is decorated with some fine carvings of leaves and acorns. It looks to have been used a lot which is wonderful I can’t wait to spin on it.